The only thing you probably want to understand about termites is how to keep them out of your house for good. You want to get rid of the ones that might be there and keep out any additional termites. Working with an exterminator near Scottsdale to put a proper termite pest control plan in place can help you do that, but learning a bit about termites can also help you understand how better to protect your home. The first thing you need to know about termite society is that it is relegated by a caste system. Though every termite starts life as a larva and then grows into a nymph, they all take on a certain class after a series of molts. Termites become workers, soldiers, or part of the reproductive class. Only members of the reproductive class can go on to become a king or queen. Soldiers and workers maintain an almost larvae-like appearance. Only the king and queen become fully mature. Termites are able to change classes, depending on the needs of the colony. Reproductive members can even regress to become part of a less mature class. The worker termites are responsible for foraging for food for the colony, as well as for feeding the soldier termites and the larvae. Some termites can cover more than 300 feet while foraging for food. Worker termites are the only ones that have the proteins necessary to digest cellulose. Therefore, they partially eat and digest the food before distributing it to other members of the colony. Soldier termites cannot feed themselves because of their large mandibles, so they have to be fed. Workers also drop the partially digested food into the mouths of the larvae, kind of like a mother bird to her babies. The worker termites are also responsible for building the nest in which the entire colony lives. They create nests by “gluing” together dirt and other organic material to create walls or tubes. Workers can leave the nest to forage for food, but they usually do so by creating a series of tunnels for traveling. They need the right amount of moisture and humidity to survive. Going out into the open air can cause them to dry out and die. As you might expect, the soldier termites are responsible for defending the nest and protecting the king and queen and the eggs. Soldier termites have oversized jaws that allow them to inject poison into pests that attack the nest. The number of soldiers in a colony depends on its size. The colony will put more resources toward establishing itself to start, so there will be more workers when the colony is young. As the colony grows and becomes more established, more termites will become soldiers to defend it. All termites communicate with each other inside the nest. They do so through a series of vibrations and pheromones. Termites are able to recognize members of their own nest by those pheromones, or scents. They are also able to distinguish their caste. Vibrations are caused by the termites banging their heads. These vibrations can let termites know when there are holes that need to be repaired or when invaders are trying to breach the nest. Sometimes, you can hear these vibrations and the general movement of the termites inside your walls. If the infestation is bad enough, you can hear the sounds with no assistance. Otherwise, you might have to use a stethoscope or another tool to hear the sounds. As you might expect, the reproductive class is responsible for mating. When they are ready to mate, these termites grow wings and molt to get a harder exoskeleton. They leave the nest through a small hole they create and that workers repair when they are gone. Then they swarm to find a mate. When they are done mating, these termites land and shed their wings. Then they go off in search of a suitable place to start a new colony. It is the swarming and the spent wings that most often help homeowners to identify that they have a termite problem. Knowing the social behavior of termites can help you identify when you have a problem. You might hear the noise or see the tunnels as the workers are foraging for food, or you might see the spent wings after the reproductive class has taken its colonizing flight. You can also see termite waste, which can look like small piles of soil or dirt. If you notice any of these signs, call an exterminator for a termite inspection in Scottsdale right away. 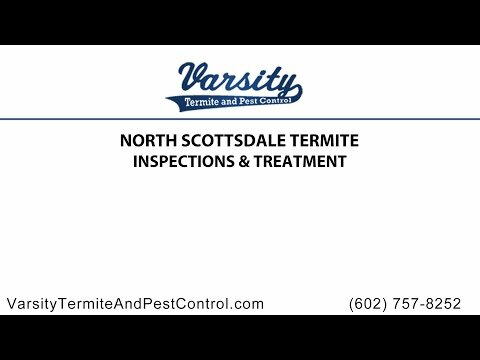 In Arizona, Varsity Termite and Pest Control can help. Our experienced professionals have a range of effective Scottsdale termite treatment options to control whatever type of termite you might have and whatever size infestation you might have. We will perform a termite inspection and then develop a termite control plan with you that is aimed at getting rid of any termites you have and preventing new infestations. Call us in Arizona today to learn about your termite pest control options. What is the Life-Cycle of Termite in Scottsdale? Read the rest of What is the Life-Cycle of Termite in Scottsdale? Read the rest of How Do Termites Reproduce? What Species of Termite is in Your Home? Read the rest of What Species of Termite is in Your Home?